MailEnable is proud to announce the latest direction for the mail server product: a fully featured Outlook integration component for mail, calendaring, contacts, and collaboration. The new MAPI solution provides complete integration between the MailEnable server and Microsoft's Outlook email and office productivity client. Enterprise Premium also includes all the value of Enterprise Edition. Supporting all the rich features offered in Outlook, including appointment scheduling, free and busy status, Public Folders, and access to shared account resources, this offers businesses all the power they need for efficient coordination and communication. Read on for more information about the various features you will enjoy when you install the MailEnable MAPI Outlook integration module, beyond the core messaging features already available through IMAP, POP and other services. Users of Outlook will likely be familiar with the features for personal calendaring, contact management, and task tracking, and MailEnable Webmail users will also be aware of these same features supported through the webmail client. Now with the MAPI connector, these two features are connected, bringing your server hosted calendar to your Outlook client on your desktop computer, along with your contact and task lists. from the webmail client, with all the latest updates made at your work desk. And, of course, likewise in reverse - if you get a phone call while you are away from your office, and you need to reschedule that appointment, you can use webmail to make the change, and when you get back to your desk, it will be updated, and you won't miss anything. If you are familiar with the collaboration features already available in MailEnable through the webmail client, you would expect that to be supported in the new MAPI connector as well. You would not be disappointed. 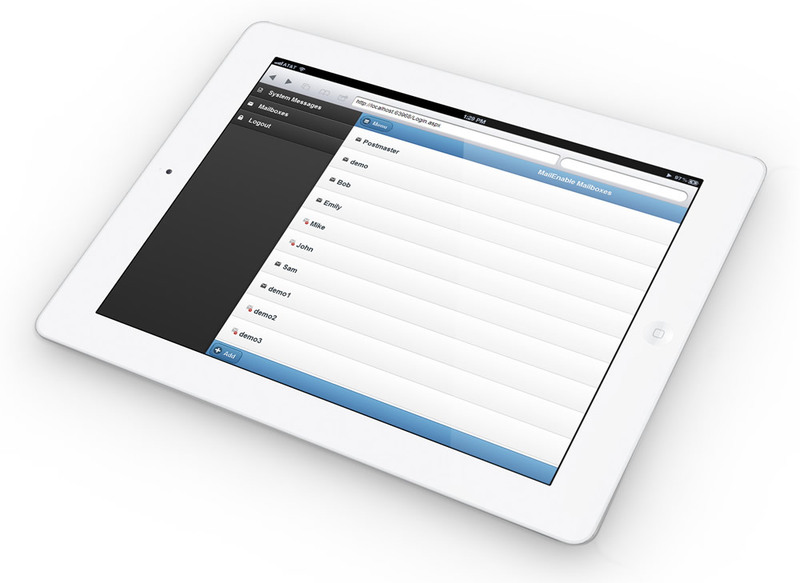 It is easy to connect to a shared resource, such as another user's calendar or entire mailbox to which they have granted you access. You can also set the sharing permissions for your own mailbox resources from within Outlook. This is particularly useful for viewing another person's shared calendar. 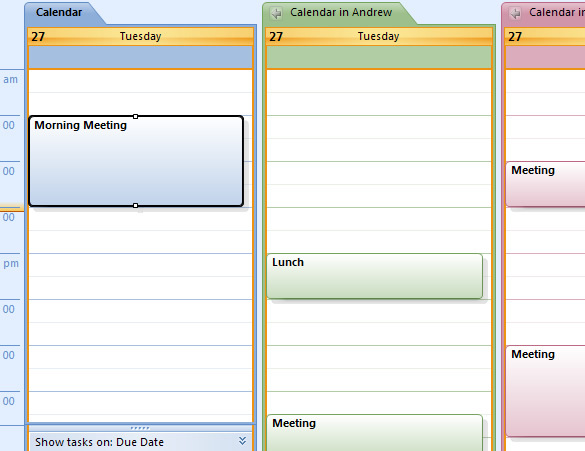 Outlook supports different ways of viewing multiple calendars simultaneously, including viewing them side by side, or overlayed, with different colouring to identify the different calendars. If you grant full write access to your mailbox for another person, such as a secretary or personal assistant, that person can act on your behalf to do such things as create new appointments in your calendar, and update the details of your contacts. With the MailEnable MAPI connector, the postoffice directory is made immediately available through Outlook's address book. This gives every user access to the company contact list, including the ability to be prompted by Outlook when filling out half of a recipient's name while composing a new message. The connector also adds a new menu to the Outlook application with a few options, one of which allows you to easily change your out-of-office status and message. When you are away on holiday or business, anyone who emails you will receive the message you configure as an automatic response, so they will know when to expect a reply. Communication is the key to the success of any team, and the MailEnable MAPI connector integrates with Microsoft's proven Outlook office productivity tool to give you an advantage in one of the most critical aspects of conducting successful business. There is no excuse for miscommunication.